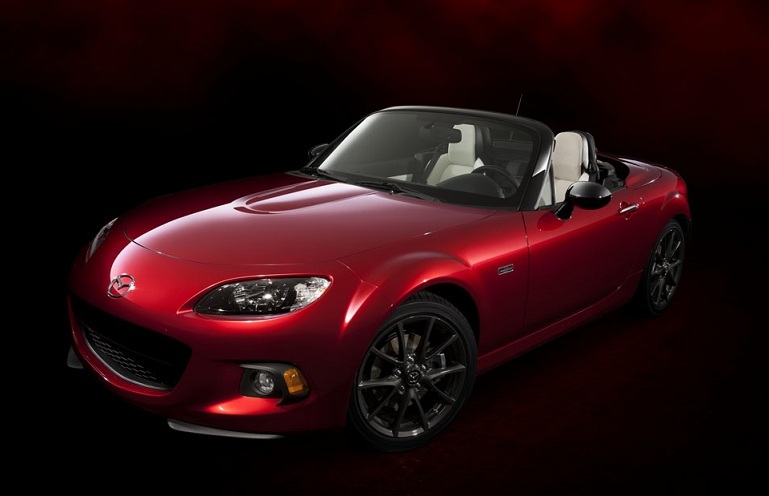 Today in the 2014 New York auto show, Mazda revealed the 25th year anniversary edition MX-5 Miata. Together with the existing model, Mazada also provides some insight about its next generation MX-5, which Mazda hopes to deduct approx. 100kg from the current model. 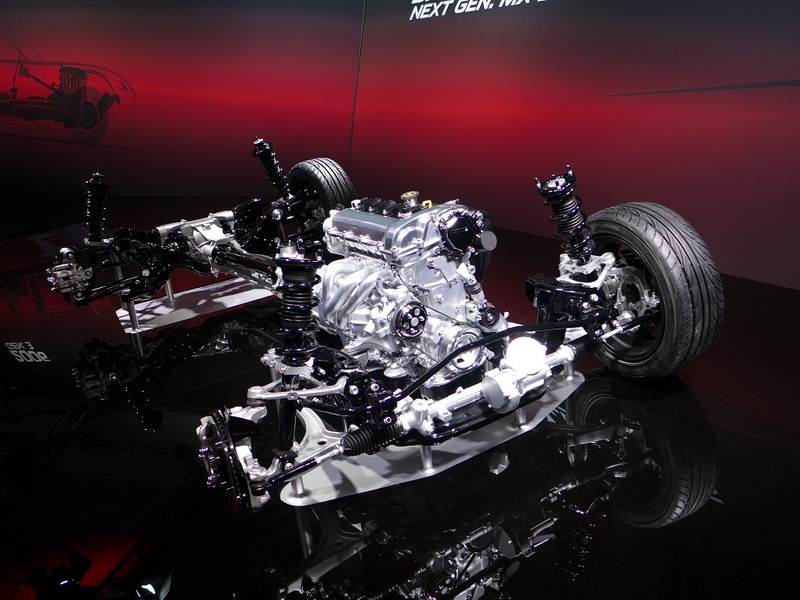 In this article, we are not going to talk about what special features that the anniversary edition MX-5 has, or what is the SKYACTIV technologies that Mazda has been mentioning during the recent years. In the following sections I will examine the Miata from a holistic view, and briefly explain why the Mazda Miata is special and what makes it so popular for more than 20 years. For those who are fans of V8 muscle cars, the Mazda MX-5 Miata may not interest them at all: because the Miata only has a 167hp, 140 lb-ft torque 4-cylinder engine – even the base Hyundai Sonata has a much higher output than the Miata. But in fact, the Miata is a true sports car. I can even say: it is an true exotic designed sports car. Here are some detail explanations. 1. The Miata is based on a front mid-engine, rear-wheel-drive (FMR) layout. From the below image you can clearly see, the 4 cylinder engine is 100% locating behind the front axle. The advantage for such layout is its superb weight distribution ratio. Of course this comes with the compromise of limited occupant cabin space, since the engine is pushed backward. Normal car design will move the engine forward on top of the front axle (FR layout), or even in front of the front axle (front wheel drive layout), to maximize the occupant cabin space. Nowadays, only high-end sports car which does not need to worry about the daily usage practicality will use such design. For this reason, many front mid-engine sports cars do not have space to arrange the second row seats, therefore they are usually 2-seaters. This is also exactly the same case for the Miata. In part 2, I will talk more about the Miata’s special structural design.